Control bites are a crucial technique when working with vertical dimension changes. Read on for Part 2 of Dr. Catalano’s approach to this complex area of dentistry. The master impression must accurately depict the posterior teeth used for the control bite. The detail and accuracy is just as important as your preparation. The anatomy of the occlusals must be perfectly represented in the impression. Check this important area when looking at your preparations. The success of your case will depend on it. The technique for getting a well-fitting transferrable control bite is to express the bite registration material on dry posterior teeth, moving in a buccal to lingual direction and gradually moving forward to cover the molars. By moving the tip buccal to lingual you will create a wide bite platform to fully cover the occlusals. If you express from distal to mesial, you will be left with a skinny bite registration that does not stay in place. Another key to accurately and easily using the control bite is to trim the bite so that it is shallow and void of any fins or sharp extensions. The fins and sharp extensions can interfere with the closure path of the opposing molars. However, you don’t want it too shallow where it will not stay in place. One trick I do is to leave it a little deeper on the mandibular side and shallower on the maxillary occlusal side. In that case, it stays in place as the patient closes into it and allows the cusps of the upper molars to fit easily into the anatomy of the control bite. 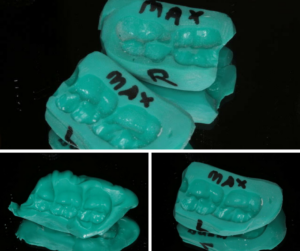 Taking control of the bite during this process will ensure a successful outcome for you and your patient. Have any questions for Dr. Catalano? Please leave them in the comments below!